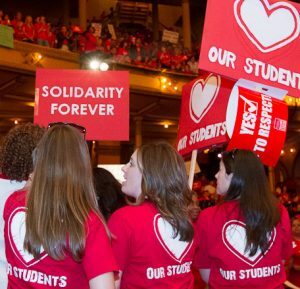 Sunday night bargaining makes clear that ability to settle strike sits in hands CICS executives who refuse to dip into surplus to avoid larger class sizes, fewer counselors, no extra funds for classroom needs, as strike moves into second week. 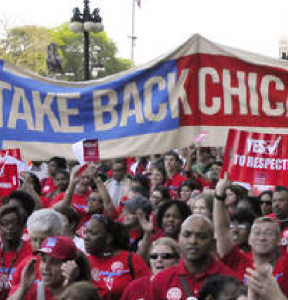 CHICAGO—Striking CTU teachers and paraprofessionals at four CICS schools will be on the picket lines again early this morning, in week two of a strike for living wages, decent working conditions and adequate resources for the schools’ overwhelmingly Black and Brown low-income students. At 1PM TODAY, Monday afternoon, strikers are heading to CICS offices, where they’ll send a delegation to the offices of CICS CEO Elizabeth Shaw to demand that she finally meet with educators from the struck schools and free some of the $36 million her office has siphoned out of CICS schools. Management is still insisting that raises for low-wage workers, some of whom make less than $30,000/year, are part of a package tied to strikers ALSO agreeing to larger class sizes, increasing already too-high counselors’ loads and getting no commitments against cuts to staffing or under-resourced student programs. Strikers refuse to accept this ‘trade’. Management has offered an 8% average raise in the first year of a new contract—not the 31% CICS has repeatedly falsely claimed to parents—a proposal that would leave staff salaries well below CPS levels of compensation for the entire four year agreement. The strikers, who teach the same student cohorts as their peers in CPS-run schools but make 20% less on average, have asked for wage parity with their CPS colleagues. CICS owns the CMOs—charter management organizations—that, together with CICS itself, siphon off up to 30 percent of the public education funds the schools receive to educate students. The fees charged to the four CTU schools by CICS and their subsidiaries rose 25% in the last year, draining an additional $1.2 million out of the schools and classrooms—nearly enough to settle the current contract. CICS’ predatory fees feed a top-heavy and duplicate management structure along with cash hoarding that has undercut classroom resources. The number of six-figure management staff at CICS increased from 4 to 14 since 2017. At their subsidiary CMO, there are 10 chiefs and directors on staff to ‘supervise’ three schools. CICS executives refuse to take responsibility for the schools they run. CICS management were a no-show at a Friday legislative hearing convened by the House of Representatives’ Committee on Elementary & Secondary Education: Administration, Licensing & Charter Schools, just as CICS ‘deciders’ have routinely dodged negotiation sessions. That hearing was convened to examine CICS’ fee structures, which is drawing growing alarm from legislators. Hundreds of CICS teachers, paraprofessionals and their allies rallied on Saturday, with strikers committing to strike until they win fair wages for workers and educational justice for students.